© Khoj International Artists Association Hemant Sreekumar is an Indian artist from Bangalore. He has a background in art history, fine arts and digital media. He creates performance art with synthetic audio using principles of emergence + also produces visual media including prints and light based works. 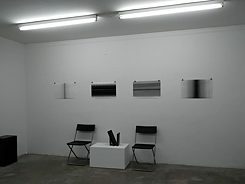 His works respond to notions of decay, generative bias and loss of semantics. Hemant likes embroidering coded computational processes to create sonic situations. He has worked in the past as a programme coordinator at Khoj International Artists’ Association, New Delhi. More recently he has been a researcher at Compart, Bremen, documenting early computer generated/algorithmic art. At present he works as a Data Visualization Consultant for W+K. 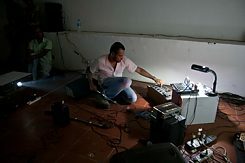 His present compositions deal with notions of measurement, decay, data sonification and stochastic emergence. Hemant presented Godsignal as part of the exhibition PODCAST curated by ex-bangaloREsident@Maraa Ralf Homann, at Kunstraum, Munich on January 16, 2019.